Pinterest, one of the fastest growing social media companies, has recently opened its new office headquarters, boasting over-sized white volumes in a 45, 000 square-foot warehouse in Palo Alto (San Francisco). The place (split in four houses) has been transformed and adapted to the needs of the employees. Spacious, creative and neat in its very particular way, the space incorporates the essence of this addictive platform we spend time on, that of bonding people with common hobbies and interests, together. The new office feels intentionally unfinished and displays interesting DIY art projects to enhance creativity and support (naturally) the creative spirit. Designed by All of the Above (New York) in collaboration with First Office (Los Angeles), this lovely Pinterest fresh “home” incites you to work with pleasure. One of the co-founders, Evan Sharp, explains: “Like Pinterest (the service), we wanted our space to accommodate the most heterogeneous set of occupations possible. That’s architect speak for, the space should enable you to work in many different ways. Whether you’re comfortable working at a dedicated desk, on your laptop at a communal table, or in a dark corner in the basement, it’s likely that you’ll find a place that works for the way you like to work.” For an additional feel of coziness, the employees were even encourages to bring at the office their own collectibles. This sounds a lot like Pinterest, isn’t it? You're reading Pinterest’s New Creative Offices in San Francisco Boasting Over-Sized Volumes originally posted on Freshome. The post Pinterest’s New Creative Offices in San Francisco Boasting Over-Sized Volumes appeared first on Freshome.com. Stacked planks have never looked more appealing, you’ve got to agree with me on this one! The Mexican designer, Hector Esrawe, presented recently his latest work, a black-lacquered sideboard that integrates with ease …raw wooden planks. The “eccentric” piece of furniture is ideal to decorate any minimalist space. Artful and neat, Stack Buffet (funny name, I have to say) is guarded on one side by something that appears to be an irregular pile of wooden panels, creating a strong contrast between the sideboard’s dark elegant design line and the rustic industrial-like nuance. What I like most about the Stack Buffet is the collision of styles. At the intersection of minimalism and industrial are originality and functionality. Quite surprising, the wooden planks are no planks at all, but drawers. I honestly appreciate this creative approach and find this piece of furniture fun and inspiring. You're reading Minimalism Meets Rustic Industrial: Stack Buffet Integrating Wooden Planks originally posted on Freshome. The post Minimalism Meets Rustic Industrial: Stack Buffet Integrating Wooden Planks appeared first on Freshome.com. Firma d.o.o. 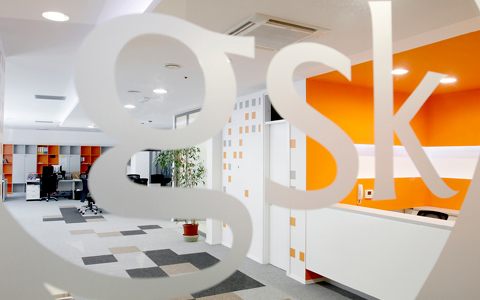 designed the new office for pharmaceutical company Glaxo in Sarajevo, which would not only be different from their previous space, but also enhance the social atmosphere and encourage collaboration among employees. The new office is designed as a functional, yet open and colorful space where employees can spontaneously share their ideas and communicate. It supports vibrant working atmosphere providing variety of work settings suitable for large and small team meetings, quite phone booths, informal lounges, presentation areas and formal workstations. Our main challenge was balancing between client strict working policies and needs on one hand, and short time frame on the other. Since the glass facade provides generous natural lightning, we decided to leave most of the facade free, concentrating majority of our work stations within the central area. Two meeting rooms and quite booths designed as translucent glass boxes with some graphic decorations in order to provide certain level of privacy are the only spaces in direct contact with the facade. The heart of the project is a large team bench that works as a node where employees from different departments, visitors and clients meet. The reception desk is a combination of clean, minimalistic lines and luminous orange color – reflecting corporate design philosophy right from the entrance. From the beginning of the design process, we followed a very simple structural scheme, taking into account the utility and economic constraints of the project. We used colorful wall decorations in public zones such as entrance lobby, reception and corridors in order to create liveliness and sense of motion in these areas. Our design scheme was inspired by both the corporate colors and the natural color palette. Even though initially simple industrial carpet seemed as a restriction, at the end it was key to the design, helping to identify connections between different areas within the open plan space. Our general idea was to create a spatial sequence of colorful and fresh corners, consisting of surfaces with playful composition of smaller and bigger squares as leitmotif. These small spaces are intended to have a special aura of oasis, metaphorically, and provide moments of joy and positive stimulation for employees during their long working hours. Multinational timber company, Losan Group, chose Mas Arquitectura to carry out an important reform in his main office, placed in Spain. The project was able to create new spaces in a limited space. After weeks of hard work, the new office was ready and able to reflect on its installations Losan’s main ideas: “Give solutions to your customer, respect for environment, energetic control, quality and new technologies”. The company’s guidelines are reflected in each space: a large wooden hall is followed by a distributional corridor which connects with a technical room, fits up with hand-made furniture. Nearly, we can find baths, a small coffee room, individual studies and a large directive room, the place where Losan’s future was decided. Natural light is another important element in this project. Windows are designed to take advantage of the views in order to create a wonderful atmosphere inside. Wooden finishes contributes to show a image of warmth. The reform was made carefully, taking care over details through the more than 350 m² office’s surface. Interior coatings were realized using solid wood made by Losan, which make clear the high quality of its goods. These new office have improved the employees’ life level and have encouraged the company’s image. We are proud of our work. Dom Arquitectura projected their own new studio creating an open interior space visually connected to the street and the garden outside. The place previously used as a store was completely isolated from the outside. The first action we take, is to open the interior space, both the street and the garden outside, so we designed a completely open iron carpentry without studs, continuous glass, providing natural light throughout the space. All the iron is dark graphite gray painted, the same of the interior furnishings. Across the glass surface is placed inside a dark gray screens, to control the space privacy. As an Architecture studio, we have some details about the profession, the graphite color of the pencils, the prevailing white color like papers and the wall parallel. The inner wall of the room is very irregular. With the goal of unifying all these folds we propose some horizontal lines that run through the wall, painted with the same gray that the continuous pavement. This allowed us to provide the wall of a plot in a gradient, starting with getting rid continuously and gradually breaking up until the roof. We designed the Lamp that runs around the room, from some sections of iron flowing freely through space with convergent and divergent lines, covered with several sheets of folded parchment paper, as if they were the same studio plans. The result is an enlightened paper path through the roof. We propose an edge distribution, where 6 tables are based on the exterior side. In the same perimeter is placed a dark shelf, which runs through the space, we can put all the books and magazines worker’s hand and hide the strip turn providing the facilities for all jobs. The bathroom walls are painted in dark as an inverted room, the plan annotation dimensions remain drawn on the walls. NAU designed the new bank in Zurich for Raiffeisen dissolving traditional barriers between customer and employee, creating a new type of “open bank”, a space of encounter. Advanced technologies make banking infrastructure largely invisible; employees access terminals concealed in furniture elements, while a robotic retrieval system grants 24 hour access to safety deposit boxes. This shifts the bank’s role into becoming a light-filled, inviting environment – an open lounge where customers can learn about new products and services. This lounge feels more like a high-end retail environment than a traditional bank interior. Conversations can start spontaneously around a touchscreen equipped info-table and transition to meeting rooms for more private discussions. The info-table not only displays figures from world markets in realtime, but can be used to interactively discover the history of Hottingen, or just check the latest sports scores. Elegantly flowing walls blend the different areas of the bank into one smooth continuum, spanning from the customer reception at the front, to employee workstations oriented to the courtyard. The plan carefully controls views to create different grades of privacy and to maximize daylight throughout. The walls themselves act a membrane mediating between the open public spaces and intimately scaled conference rooms. Portraits of the quarter’s most prominent past residents like Böklin, Semper or Sypri grace the walls, their abstracted images milled into Himacs using advanced digital production techniques. While intricately decorative, the design ground the bank in the area’s cultural past, while looking clearly towards the future. Upsetters Architectes refurbished the office for FICC Inc., a website promotion agency in Shibuya, Tokyo. The extensive office has many windows in the unusual shape and rhythmical columns. We made two boxes (rooms) in the spacious space as its entrance hall and meeting room. The rest is used as the working space and backyard. In other words, there is a clear relationship between inside and outside the boxes: entrance hall and meeting room inside, working space and backyard outside. Furthermore, both surfaces of each box are finished with the same material to intensify the inside and outside. Firstly, the entrance hall is carefully designed with the minimum necessity and covered with stone so that the visitors will be quietly welcome. Secondly, in the meeting room covered with American Ash, people can feel not only Japanese sensitive aesthetics but also the characteristics of the whole, such as successive windows and the “blank” space by them. It must imply the company image of FICC inc. The two boxes are connected with the glassed passage in the light so that the visitors could sense the clearness of the company *s work and the liveliness of its most young staff. The working space outside the boxes is intended to be spacious and fit for computer working. The “blank” space by the windows is prepared to provide the ideal light environment so that people keep the blinds drawn up even during their work with computers. It is also expected to be used freely like as a terrace. Creneau International designed a notorious signature office located in Belgium. At Creneau’s, we firmly believe it’s our right to advocate ideas of the anti-ordinary. Blatantly ignoring the laws of Office Interiors, we came up with our own contemporary interpretation of how a legal firm should look like. In the waiting room, two artworks featuring the lasered signatures of the founder and his son function as a personal welcome to the visitor. Over to the main meeting room, via a “naked” staircase that appears to be kept in place with steal cables. Desktops discreetly rise from and disappear into a custom-made table, wooden table tops introduce warmth into the industrial frame of the office. Piece the resistance in the building is a private meeting room that can only be reached through a secret stairway in the main meeting room. Featuring a wall of (fake) books that doubles as an acoustic screen, and classic cornice mouldings framing the concrete ceiling, this room exudes contrast and creativity. Since 1989, WE have established a strong reputation as visionary and trendsetting designers. Our ideas of the anti-ordinary MAKE brands flourish, products grow and businesses boom. Our added value is to provide full service: from all-round consultancy to concept development, from logo and packaging design to interior design, from implementation to franchise follow-up. Whether YOU are a challenger brand around the block or an iconic brand spanning the globe: we help you REACH your audience. In shops, shops-in-shops, hotels, restaurants, bars or nightclubs as well as offices, showrooms, exhibition stands and events. FOR all we care, we tell your story on the moon. As long as you connect with your consumer. At Creneau International, we know your success is written in THE STARS. You just have to reach for it. Like we said: hac itur ad astra. Atelier Thomas Pucher & Bramberger designed this office building in Graz, Austria. Nikolaiplatz as it stands today was a process of conversional development which took its shape over a period of time. While the architectural style (as well as the desired building density) changed, the site layout remained stably constant. Due to the growing density in the immediate surroundings of the area, the requirements of a building on that site had to be adjusted over time. Today the heterogeneous urbanistic situation requires a boundary of space on one side – towards Nikolaiplatz –, and a significant free standing form on the other side – towards Entenplatz. Due to the very complex urban planning, technical and economical requirements we designed a building, that is calm and reduced, but at the same time a dominating aesthetic solitaire. This building becomes a sculpture through its simplicity. Based on the clear steel framed structure with light weight wall panels, a multifaceted playful facade with clear vertical alignments appears. The closed elements on the façade have a gold glimmering appearance and can accommodate shelves or archives on the interior. The height of the building adapts with the surrounding buildings and mediates between a high – density area and an open space. COEN! designed a colorful office landscape with “identity layer” for the MBO Raad Dutch Association of VET Colleges. Everyone is unique. COEN! has the expertise needed to translate this uniqueness into a consistent and powerful corporate identity which fits like a glove. That’s why I started workshops to let clients discover their unique identity. This makes it for me easier to create afterwards an identity that reflects the soul of the company. So this identity lasts longer and communicates stronger. And, more important, the company creates an identity inside out instead of outside in. This has lead to this interior that feels like home for the employees: hay have created it together with our agency and the architect. Our agency designed also sixteen colorful patterns for this organization, representing the various professional fields. All VET colleges are representing one or more professional fields like trade, communication, transport, etc. These patterns have been printed on wall covering and furniture. This total approach makes it a project with an strong “identity layer”. Coen van Ham (1971) is a Dutch conceptual designer, architectural designer and source of creative inspiration. He studied at the renowned Design Academy in Eindhoven. COEN! is one of the leading agencies in the Netherlands on account of its innovative concepts, stunning designs and inspiring workshops. His style is colourful, graphic, sober and communicating. COEN! shapes and guards over identity. Designs for your works of art, corporate identity, product and interior are all based in a powerful and unique concept. Designs by Coen van Ham have been included in several design and art collections. His work was shown in a diverse range of exhibitions worldwide. Coen’s work has been featured in numerous magazines and books. dagli + atélier d’architecture designed the extension of the company headquarters of Sanichaufer, one of the biggest Luxemburg-based firms in building services engineering, as a showroom displaying the most modern building technologies. casaPública designed the management and operating facilities of German company Krauss Maffei, located in the industrial complex Benito Juárez in Santiado de Querétaro, Mexico. The office is build inside an industrial building with a structure that couldn’t be touched. A new freestanding two level structure, with the possibility of being dis- mantled, is erected in the interior of the facility, allowing a maximum amount of free space for exhibition and heavy equipment manoeuvring of up to 50 tons. It’s façade and form, as well as the selection of materials, are the strict result of function and the required program, just as the simplifi- cation of circulations, clearly showing the visitors the way to take. In addition, the facility has a call centre, two showrooms, training area, kitchen – eating room, a heavy equipment warehouse, a meeting room, of- fices for 25 people and service areas. The corrugated aluminium panels used for the façade gives privacy and se- curity to the personnel from any possible accidents. The glass transpar- ency separating the office area from the showroom allows permanent visual contact between management and technical tasks. Kreacja Przestrzeni designed the interior for this moodier law firm, which is both contemporary and dynamic in design, comfortable and underline the individual’s character. The building developer bought the premises as an “open space” area in a modern office building. So, my work began with dividing the space into separate, individual rooms, adjusted to this division. I completely redesigned the lighting, heating, air conditioning and electrical systems. Particular attention was also given to internal and external fixtures and fittings, including: furniture, wall coverings, windows, doors, door frames and medium density fireboard elements. All of which met existing design requirements. As there are no suspended ceilings in the rooms, installing the air conditioning was an initial challenge to be overcome. Particular attention to aesthetic elements was adhered to, to avoid markings on any surfaces during the air conditioning installation process. This was achieved via concealing work markings as construction progressed, within the finished work surfaces. The building contractors therefore, assembled the all elements of the construction design to the highest finished specification. This was achieved for example in the assembly of the doors (which were customer-made and of a non-standard height). When work began on this project, we adhered to the investor’s design plans and expectations. The investor was keen to incorporate his personal character into the finished designs. However, he was also very open to new ideas and proposals, caused due to the financial reasons. And an open dialogue between the investor, project designers and builders produced a finished product, incorporating design elements of all interested parties. The end result is a feeling of comfort and an individual character of the interior. This has been reached by simple and not striking elements – a minimalistic form of the furniture, beautiful lamps (here: Vibia Slim lamp in the secretary office and a Skirt lamp, designed by the Axo Light, in the conference room) and also by the use of unique upholstery of chairs of a highly distinguished checked glossy pattern. Another unique element of the finished design is the Bowler Hat lamp, by Innermost, in the bathroom. An emphasis on detail may be appreciated throughout, e.g. a flat surface with a logotype highlighted by LED lamps, a see-through graphic motif on the milky glass doors of the conference room, or the same motif thawed into the doors’ leaves. Kreacjaprzestrzeni Architektura designed an original and individual work space that would break away from conventional offices we see every day. Our space was to be worker-friendly, guest-attentive and cooperation-enhancing. Therefore, we said “no” to posh design and created offices “with a pinch of salt” – the attitude which gave birth to light graphic motifs in the halls, innovative and beautiful wallpapers, in vogue, Scandinavian furniture, a rocking armchair (an armchair with skids) in the president’s office, and charming lamps Vertigo Birds such as Boy’s Lamp designed by Nika Zupanc. We were strongly encouraged by the investor to shape a nice and natural work environment giving up hierarchy marking: the president’s office were to be of an equal rank to employees’ offices. The very building has been occupied after another company, which affected the limited number of electrical changes that were made. Bearing in mind cost reduction policy we kept doors and ceilings after the previous holders. Additionally, the investor wanted us to make use of ready-made, serialized furniture and he determined the number of workplaces to be provided in each office. However, he did not insist on any given design of the interior. Since he aimed at creating a Polish branch of an already existing company, we were given the logo of the company and the type of business activity run. With all that information, we were expected to provide an amusing design plan of the interior. COEN! created a new working environment and identity layer for the Besturenraad / BKO in Woerden, the Netherlands. The two organizations are going to cooperate more intensively at a new location and take care of two denominational types of education in the Netherlands: Catholic and Protestans. The aim of this project was to visually connect the shared goals and principles of both organizations. For the design of this story they used The Book as a metaphor. Apart from the Christian and Catholic values a book also consists of structure, text and image. You see stained glass pattens, metal grids based on the golden section and special text prints with a message. The relation between faith and education is also subtly made clear by DNA patterns and golden “office altars”. Grosfeld van der Velde Architecten designed the house located on the edge of the Asterdplas in the Hague district meadows in Breda. The living area is raised above the surrounding land, so that the view of the natural environment is optimal. Large terraces immediately adjacent to the main living areas and large windows give the house a light and transparent character. The house also contains a basement-office in which the owners welcome their clients; this routing is well integrated in their private domains, without literally crossing them. MAS Arquitectura designed this office that combines functionality and relax to create a suitable atmosphere for working. Office’s concept has changed. Nowadays, companies are looking for wide spaces where their employees can feel at ease. MNProgram, a Spanish company leader in management software, has built his new office following this revolutionary concept. The office, placed on A Coruña (Spain), is characterized by high quality materials; views over Atlantic sea and relax spaces, including a living room with TV plasma and sofas and a nice kitchen where enjoy snacks. Design bets for open spaces. Consequently, job places have been arranged longitudinally along the large window, in order to take advantage of natural light and provide employees with spectacular views over Atlantic Ocean. As a result, movement inside is agile and direct. A quadrilateral space, called “the ring”, dominates the central space of the office. Built in wood, “the ring” offers creatives a pure atmosphere to work away from the daily stress. Other spaces, as bathrooms -whose access is done using a footbridge-, or kitchen -equipped with TV, sofa and a larder-, contributes to employees enjoyment. Indeed, natural light from Atlantic sea makes easier spend a day in this office, designed by Marcos Samaniego, from Mas Arquitectura. The project includes high quality materials. Natural wooden finishes are combined with satin-finishes in work space. Grass is a special guest. Remarkably soft, grass covers not only the floor but also several walls. It’s only one of MNProgram office secrets. ArchitectenConsort designed the wave-like GT Tower East intended for parking, commercial functions and offices in Seoul, South Korea. The GT Tower East will form an architectural unit with the GT Tower West, yet to be built. With its elegantly undulating glass facade, the new high-rise brings a fascinating change to the angular architecture of the Korean capital. The form and positioning of the 130-metre-high building are the impressive result of the vision of the architects. They chose a uniform, glass finish for the facade, which has resulted in an organically pure form. The undulating motion of the facades provides an optically changing primary form when passing the building. Combined with the reflection of the light in the glass, this gives the building a special, iconic appearance. The dynamic appearance of GT Tower East is reinforced by the sight of the building, that seems to be dropping down below street level. As it were the building rises out of the Korean soil and then reaches upwards in a dancing movement, up into the infinity of the sky. Jensen Architects designed this office located in San Francisco with custom mobile workstations to allow employees to easily relocate. Each desk has a formed polycarbonate privacy screen. Other elements in the office include a two-story-tall plant wall that screens the glare from eastern windows, a tunnel-shaped room that takes its form from the vertical bicycle storage, and a dining counter for lunch and meetings. Built-in upholstered banquettes provide extra seating and give the space a relaxed, lounge-like atmosphere. Madland Estudio designed the new head offices of a film and TV production company in Madrid. The concept of the project is to create a work space that thanks to its transparency can show the visitor the production process. The most important work rooms, where the “product” of the company is being made, should be visible to the visitor and client. As a result a transparent volume is created to locate the main work rooms in the center of the space. A showcase volume, open, transparent and visible to everyone. This central piece articulates and separates functions within the office, acting as an organizing piece.